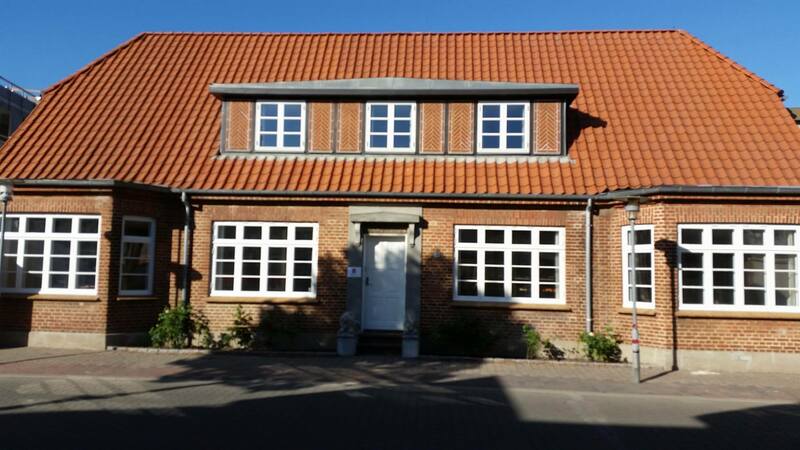 Billund is a small town in the Jutland region of Denmark. It’s where LEGO was first developed and created and is some what of a Mecca for hard-core LEGO Fans. Many LEGO fans are drawn to the town because of the LEGOLAND theme park but there are many more LEGO themed things to see and do around the town. One of the primary reasons for visiting Billund is to go to the LEGOLAND theme park. The park is primarily aimed at children but there’s still lots of fun things to see and do for adults in the park. Apart from the fun of being on a ride, the main reason to go on the rides is see the LEGO sculptures that may not otherwise be visible. This is particularly true of the Polar X-plorer, the Vikings River Splash, the Pirate Boats, the LEGO Canoe rides. The Mini Boats and LEGO Safari also provide close ups of the LEGO models though these are mostly visible from outside the rides. There are quite a variety of rides from the sedate monorail or LEGOTOP to the high speed Polar X-plorer and X-treme Racers. LEGO is not cheap in Denmark. For the most part it’s not good value for money to purchase large sets at LEGOLAND but that doesn’t mean there aren’t other things you could purchase. Apart from the two shops near the entrance, there are smaller, thematic shops spread around the park and these are often worth looking at as they sometimes have unique souvenirs that cannot be purchased elsewhere in LEGOLAND. It might be an engraved lunch box, a mug with your name on it or a piece of themed LEGO wear – every small store has something special. There is also a discount store located between the Big Shop and the LEGOLAND hotel entrance. Don’t expect too much of a bargain, however, as it’s mostly clothing and novelty items. Every LEGOLAND has its own Miniland and they are all quite different. Sure, there will be some buildings that you will see in more than one park but every Miniland is a reflection of its location has something unique that can only be seen at that park. Highlights of LEGOLAND Billund includes the working lock in the Switzerland section, the Nyhavn section of Copenhagen and the buildings styled on the original Miniland buildings. A fantastic overview of Miniland can be seen from the LEGOTOP ride. Miniland has thousands of tiny lights inside the buildings, the trains and streetlights. They are lit up at night and it adds a whole new dimension to the display. Worth seeing it you are there on a late opening night or staying at the LEGOLAND hotel. Entry to the park is free from around thirty minutes before closing. The rides will probably be closed by then but you’ll be able to visit the stores and look around Miniland. 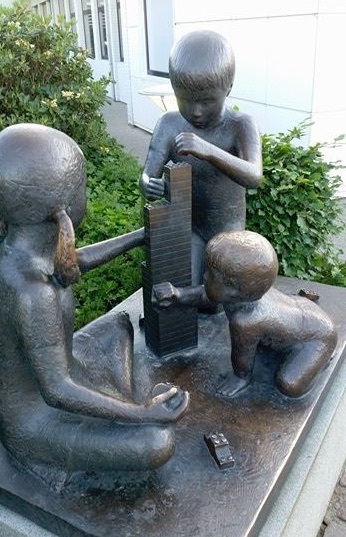 There is a lovely sculpture dedicated to LEGO and play located on the left hand side of the park entrance. The ultimate place to stay in Billund is the LEGOLAND Hotel. The hotel is decorated throughout with LEGO theming and features a number of themed hotel rooms and play areas. Some of the rooms over look the LEGOLAND park and you can have the fun of watching it come to life (or close down at night). There is also a small LEGO store located just inside the hotel foyer. Part of the Billund Holiday Resort, the LEGOLAND Holiday Village provides options for families on a budget. LEGO themed rooms are available in the motel section or there is the option to stay in cabins or in your own tent or caravan. Scattered throughout the park are LEGO sculptures and it is a delight to walk through the grounds to find them all. The small store at the front of the Holiday Village sells LEGO along with other goods you might need for your holiday. The Ideas House features a small museum of the history of LEGO products from their wooden toy beginning through to the modern era. The display starts in the house that once belonged to Ole Kirk Christiansen, the original founder of the LEGO company and continues into a concrete building that appears to feature LEGO studs on its outside walls. Though the display is primarily for employees and not generally open to the public, it may be possible to arrange a viewing through your local LEGO User Group (LUG). 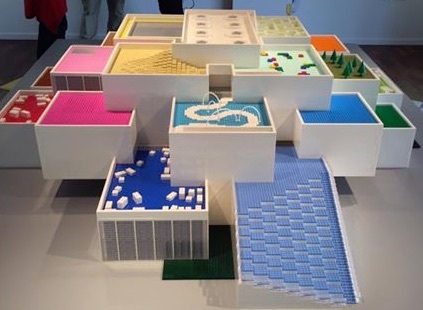 The historical displays, which were previously viewable within the windows of the building, have been removed but a more detailed history can now be seen as part of the LEGO House experience. Located across the road from The Ideas House is the LEGO House. This architectural marvel features interactive zones, a museum, three eating establishments and a LEGO store. Even with a full day it’s almost impossible to see and do every activity in the time available. The website has details of parking, opening times and entry costs. With the opening of the LEGO House in Billund there is now an official LEGO Brand retail store in the home of LEGO. Even though it is located within the LEGO House complex, there is no entry fee to visit the store and it carries a large range of LEGO products and souvenirs for the LEGO House. The store is currently stocking the LEGO Tree of Creativity set which is exclusive to the LEGO store at the LEGO House. This set has limited availability and is restricted to two sets per person. Lalandia is an experience in itself with its water park, restaurants, bowling alley, ice skating rink, stores and other assorted activities. Within the retail area can be found the Monky Tonky Factory which sells a wide range of LEGO and sometimes features discounts on discontinued sets. 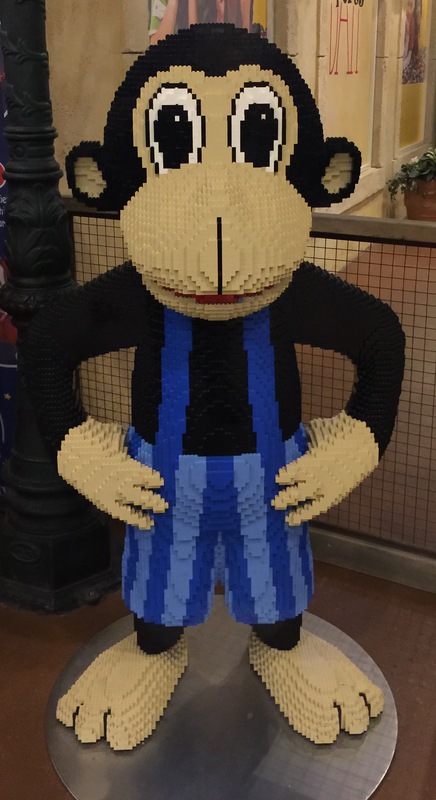 There is also a LEGO sculpture of the store mascot. There is no fee to enter Lalandia and access the store. On occasion, LEGO sets and LEGO branded/licensed items have been found in the supermarkets in Billund. Probably only worth checking if you have some spare time. If you haven’t quite had your LEGO buying fix, you can also purchase LEGO products from the small stores at the LEGOLAND Hotel (inside the foyer) and the LEGOLAND Village (at the kiosk). 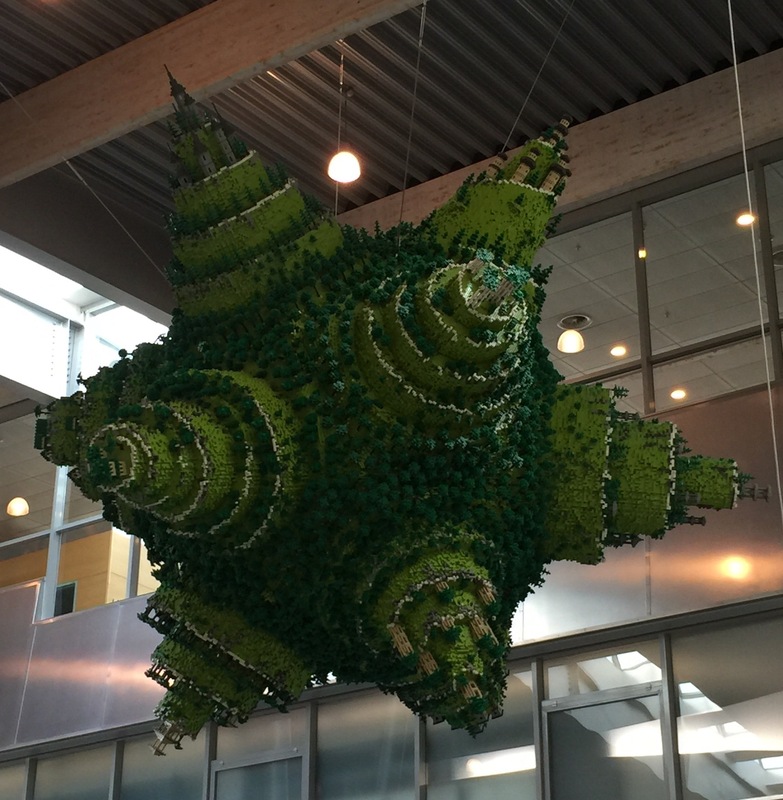 Installed in 2003, the green LEGO sculpture hanging from the ceiling at the Billund Airport goes by the name of “I was the one who gave permission to a slight degree of planting but after the holidays everything seems to have turned green” and was donated to the airport by Kjeld Kirk Kristiansen. 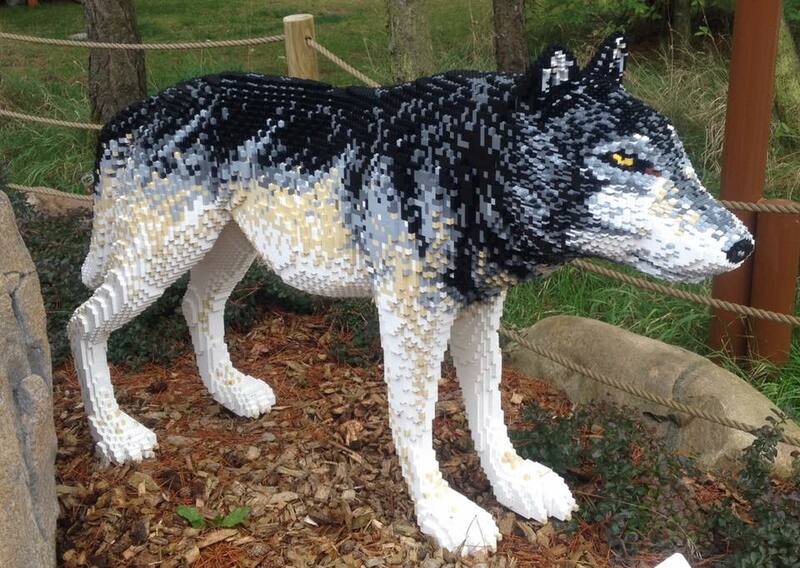 It took just over a year to build and contains over 780 kilograms of LEGO. Within the secure departures area of the Billund Airport can be found a small LEGO store and this is your final opportunity to purchase LEGO products before leaving the home of LEGO. Bricks 4 kids is a LEGO themed franchise that operates across Australia. They run birthday parties, workshops and after school and holiday programs for children using LEGO bricks. Their location varies according to the activity. Details of their current workshops and activities can be found at their website or on their Facebook page. Bricks n Fun considers itself to be Brisbane’s number 1 LEGO specialty store. It’s a big claim but they do have an impressive set up. Not only do they have a great range of current LEGO sets but they also have a large selection of loose parts available to purchase. They also operate a Bricklink store. At the back of the store they have a large LEGO display featuring a city with trains, display of the history of LEGO and working Technic models. The Build Room features a variety of new and old sets that can be built for a small fee and is available for bookings for children’s parties. Bricks n Fun can be found on Facebook. The team behind Bricks n Fun also coordinate the popular Brick Events LEGO Fan displays in Brisbane and regional areas. Building Block Studio is a family run modern learning activity centre that specialises in LEGO but also caters for interests in 3D printing, coding and electronics. The centre runs school holiday programs and workshops but is also available for drop in LEGO play and birthday parties. Drop in play may not be available during school holiday time. Further details can be found at either their website or their Facebook page. Australia’s first LEGO Certified Store will be located at the Dreamworld theme park on the Gold Coast about an hours drive south of Brisbane. It is likely to feature a Pick a Brick wall along with store exclusives and hard to find items. As a Certified Store, it does not support the VIP program. Moore Educational is a long established centre for LEGO education in Brisbane. They provide workshops for both teachers and students as well as birthday parties and school holiday activities. . LEGO Education sets, LEGO merchandise and regular LEGO sets are available from their website and their store in South Brisbane. Details of their activities can be found on the website or on their Facebook page. Opening hours: Tues-Fri: from 1000, Sat: 1000 – 1500, closed Sunday and public holidays, open Mondays during the school holidays. Opening hours may vary depending on the days activities. Switch Bricks is a pop-up play centre and LEGO display based in Ipswich. It operates during the school holidays and provides two daily sessions of LEGO-based play. The sessions are aimed at children and adults may only attend if accompanied by children. Details of their sessions and other up-to-date news can be found on their Facebook page and website. Opening hours: Two daily sessions during the QLD school holidays, 0900 – 1200 and 1300 – 1600. Brisbane has its own Ryan McNaught models which can be found at the Lady Cilento Children’s Hospital. The LEGO models were originally on display at the old Royal Children’s Hospital and the Mater Children’s Hospital whilst the Lady Cilento Children’s Hospital was under construction. They were moved to their current location once construction was completed and the two hospitals were merged. BrisBricks is one of two LEGO fan groups based in Brisbane. The group holds regular meetings on the second Saturday of most months except January, June and October. They also hold popular LEGO Fan displays in June and October. Details can be found on their website, Facebook group or Facebook page. The other LEGO fan group, the Queensland LEGO User Group (QLUG) has the primary purpose of connecting people in more remote areas of Queensland through social media. Their initiative has lead to the creation of a number of regional LUGs that now have their own meetings and events. They have irregular social gatherings but are likely to organise one if a visiting AFOL is in town. QLUG members participate in Brisbane-based and regional displays coordinated by Brick Events. Details of upcoming events can be found on either the QLUG Facebook group or on their webpage. Melbourne is a cosmopolitan, multi-cultural city in the South Eastern Australian state of Victoria. There is an active AFOL (Adult Fan of LEGO) community and it is home to Australia’s only LEGO Certified Professional (LCP), Ryan McNaught. Here are just some of the things that might be of interest to a visiting AFOL. Originally located in Traralgon, I’m Rick James Bricks is now located in Pakenham and is in its 8th year of operation. Rick mostly stocks new LEGO sets along with popular 3rd party compatible lines (Brick Arms, Light my Brick etc). There is also a popular Pick a Brick section where you can buy new bulk LEGO bricks. The store can also be found on Facebook. Moore Educational is a long established centre for LEGO education in Melbourne. They provide workshops for both teachers and students as well as Saturday workshops and corporate team building exercises. LEGO Education sets, LEGO merchandise and regular LEGO sets are available from their website and their store in Docklands. Myer is a well-known department store in Australia. Many of their stores in the capital cities, like Melbourne, feature special LEGO displays and are worth visiting just to see the unique models. The Melbourne City store features local icons rendered in LEGO bricks by Ryan McNaught and his team. There is also a good range of LEGO sets available to purchase. Shopforme is an independent LEGO and pop culture store that specialises in providing a “Daily Blitz” special offer at 11am. Their physical store has limited opening hours but all stock is listed on the website for ease of purchase. Shopforme can also be found on Facebook. Toy Bricks.com.au is an indepedent LEGO retailer who has a comprehensive range of new stock along with some retired/collectable items. They also sell the Life Lites brick lighting system, train track, and other LEGO related accessories. Individual minifigs can be purchased along with items from a bulk brick section. Toy Bricks is also associated with the ToyBricks (OzBricks) Bricklink store and any online orders placed there are be collected from their Bayswater store. Toybricks.com.au can also be found on Facebook. First held in 2006, Brickvention is Australia’s premier LEGO fan event and is held every January at the Royal Exhibition Building in Carlton. Public Expo tickets are usually available from mid-year but it varies so check the Facebook page to confirm. The event is popular amongst the local AFOL community and attracts exhibitors and general attendees for all over Australia and around the world. Further information is available from the website. The Melbourne LEGO User Group (MUGs) was first established in 2000 and has been meeting regularly ever since. It is an active community with many members both within Melbourne and the wider Victorian community. Meetings are free to attend and are held on the second Sunday of the month at the Baseplate in Irene Street, Preston. In addition to monthly meetings, there are also special events held throughout the year. Check the Facebook group for more information. The Melbourne Tram model was constructed many years ago and has travelled to a number of locations across Victoria. The model consists of over 7500 bricks and took nearly 180 hours to build. Although the model needs a little bit of TLC, it is quite unique and worth visiting if you are in the area. Ryan McNaught is Australia’s only LEGO Certified Professional and is responsible for many of the LEGO sculptures seen around Australia. If you are interested in seeing some of his work whilst visiting Melbourne, these are some of the more accessible locations. Based on the design of the actual observation wheel, this model can be found in the gift shop at the base of the Melbourne Star in Docklands. Toby the Toyworld mascot features in this display at Toyworld in the Southland Shopping Centre. He is currently located in the front window of the store. There is also a side window display which features a large minifigure with a hotdog and a large yellow LEGO brick that were also constructed by Ryan and his team. The two Duplo-style giraffes in the same display were constructed overseas. 1) Always ensure your display is labelled with an Exhibit Info Card (aka MOC Card, Info Card etc) so people know who is responsible for the build. If everyone is printing in colour, you should aim to do that too. Some events will supply a standard stand for you. For others, you will need to purchase a stand. Check with the event organisers if they haven’t already mentioned it. 2) If you have a group of collected exhibits, only use one card for the whole layout/display and not one for every single item. For example: a group of spaceships by the same person could be called “The Galactic Armada” rather than naming each ship. This request is to prevent your display looking cluttered with Exhibit Info Cards which may detract from the actual models. 3) Try not to put too much on your display. If possible, link items together in a diorama rather than it just being a display of models. Using the spaceship example again, rather than having individual spaceships, create a space base or a hanger so there is some cohesion between the models. Make sure there is plenty of space between each model. Don’t try to fill every bit of your table with lots of models. If you put too much on your display, nobody will be able to focus on the detail of each model. 4) If possible, give your display some height so it is visually appealing. This might be via a mountain side if building a landscape or via some form of small plinth or stand if displaying individual models. There are many ways this can be achieved and it will make your display stand out and draw the attention away from those that are all the same height. 5) Make sure your exhibit is clean and has most of the dust removed. People will notice the dust. A paint brush or make up brush are good dusting tools. Try to do this before you get to the venue. 6) Ensure your display looks tidy throughout the weekend. Avoid leaving coffee cups and drink cans on the table. Check your display every few hours to see if anything has fallen over or needs repairing etc. Although most patrons are usually pretty good, it is easy to bump a table and disrupt a display. 7) If you are worried about a particular minifig being on your display because it is valuable, then don’t display it. 8) Where possible, avoid placing items close to the edge of your display. If your display goes right to the edge of the table, consider requesting a second table so your display can comfortably sit on the tables without having to worry about it being bumped. 9) When transporting exhibits, make sure they are securely packed in a strong box. Custom made boxes often work best with large exhibits. We recommend the use of plastic wrap (glad wrap or specialised postal/pallet wrap) to hold the model together and bubblewrap to avoid bumps in transit. It also helps to place smaller models in individual ziplock bags. Do not trust that a model will survive in the back seat of your car or an ordinary suitcase. 10) For larger exhibits, we recommend modularising the build so it is easier to transport. Considering the size of the population, London is not very well serviced in terms of things to see and do for the visiting LEGO Fan. If you only have limited time in London, there is bound to be something you are able to see and do. If you have never been to an official LEGO Brand Retail store, then you really need to go to at least one of these, as they are both reasonably easy to access. There’s not a lot of difference between the two and you could happily visit one without visiting the other. They are both located in large, busy shopping complexes so be prepared for potential crowds if visiting on the weekend. If you are able to visit early in the month you’ll be able to build the Mini Monthly Model Build. This is often very popular so it may be a busy time. Check the store calendar for exact dates. You can expect the store to have a large range of sets from various currently available themes. They may have some items that are not normally available from retailers in your country – like polybags, key chains, magnets and other LEGO themed products. There will also be a “Pick a Brick” wall where you can purchase LEGO pieces in bulk. Hamleys Toy Store is infamous for being the first place LEGO was sold in the UK. It should be high on the list of places to visit for any LEGO fan passing through London. Not only do they have a great range but the staff are also very friendly and helpful. Highlight of the visit is the display of LEGO sculptures featuring the Royal Family and a classic red telephone box. LEGOLAND Windsor is located outside of London but is worth a visit if you have a day or two spare. Check the website for opening hours as it varies according to the time of the year and the day of the week. The park is usually closed over winter. Advance ticket purchase via the website may save you some time and money. The park primarily caters for children so this will be reflected in the attractions. Having said that, each ride contains LEGO sculptures and artwork that may not otherwise be visible making it worthwhile visiting them all no matter your age! The Miniland section of the park is full of fantastic models and it is very easy to spend hours looking at all of the details. The Star Wars Miniland display is the best of the three European LEGOLANDs and is worth including as part of your visit to the park. We recommend clearing the memory of your camera and taking extra batteries, as there is a lot to photograph! Pricing for LEGO products is comparative to other retail outlets in Europe but you may find a bargain in the Last Chance Marketplace. Nearest train station: (from London Paddington) Windsor & Eton Central via Slough on the First Great Western; (from London Waterloo) Windsor & Eton Riverside on South West Trains. There is a shuttle bus service to the park near to the two train stations. There is an additional fee to catch the bus. 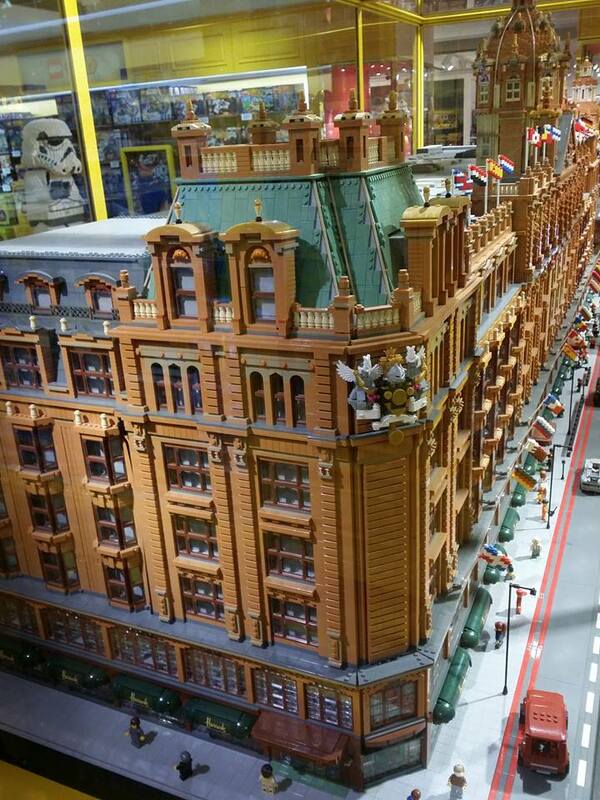 Hidden away in the toy department of the iconic London Department store, Harrods, is a magnificent scale model of the store built out of LEGO bricks by the team from Bright Bricks. Nearest train station: Knightsbridge on the Piccadilly line. Use the Brompton Road exit. The store is also only a short walk from South Kensington station on the Piccadilly, District and Circle lines, and Sloane Square, on the District and Circle lines. The Adult Fans of LEGO in London have regular meetups on the second Monday of the month at the Princess Louise pub in Holborn from 6pm. Activities may include building with LEGO bricks, swapping minifigs or generally chatting about LEGO products. You must be over 18 to attend these meetings. Further details can be found at the group’s Meetup page. Though not strictly a LEGO themed activity, you might like to visit a newsagent (or larger supermarket) to look through the English magazines. There are currently four titles aimed at children (Friends, Chima, Ninjago and Star Wars) that may come with a free gift. Additionally, you may be able to pick up the latest edition of Blocks magazine. Applying stickers to LEGO creations whether they are sets or original creations can be rather challenging. Sometimes it doesn’t matter if they are slightly crooked but other times it can ruin the appearance of a model if they are not quite straight. Once you have applied the stickers, it can be difficult to remove them to reposition them and, sometimes, you still won’t get it correct. 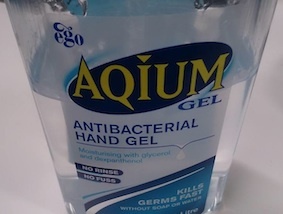 Even worse, if the sticker has a clear backing, you may end up with visible fingerprints on the clear part of the sticker. 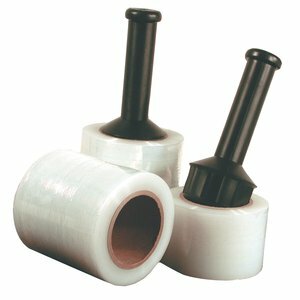 There is no correct method or way of applying stickers that guarantees they will be always applied straight but there are a couple of techniques that are recommended by seasoned sticker users. These techniques should improve your chances of correctly placing a sticker or easily removing it if you have made a mistake. The main key to ensuring sticker success is to use some sort of a tool to which the corner of the sticker can be partially applied. Recommended tools include the edge of the brick separator, the tip of a paper cutter, knife or blade, tweezers, a toothpick or the edge of the original sticker sheet. With each tool only a small part of the sticker is attached so the majority of it can be applied to the LEGO piece. 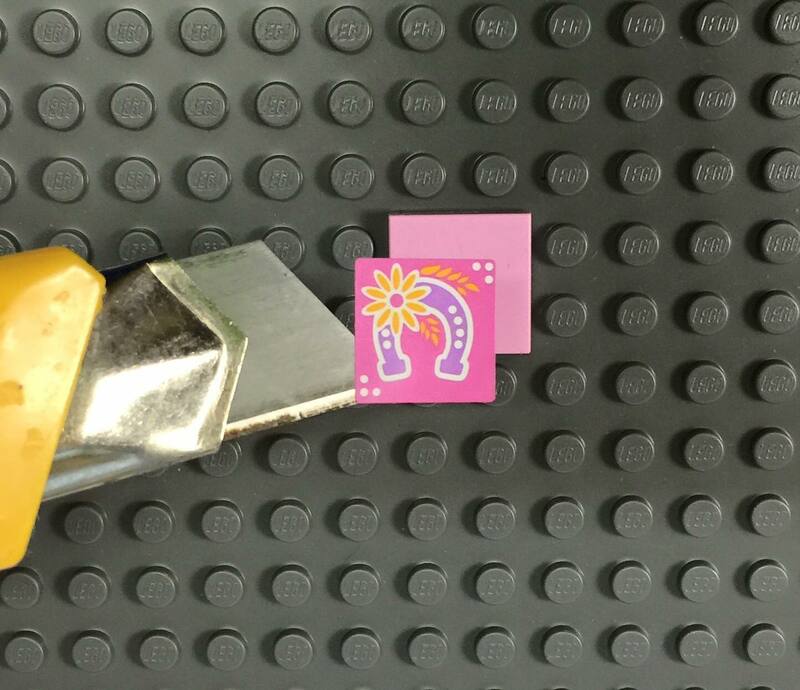 If a mistake is made, the sticker can then be easily be removed from the LEGO piece and reapplied. Apart from issues with ensuring the sticker is straight, you may also encounter issues with the piece moving as you attempt to apply the sticker. To avoid this, attach the part to be stickered to a larger plate or similar where you can easily hold it in place without your hands being anywhere near the actual LEGO piece. When working with older or second-hand LEGO bricks, it is not unusual to find some of the pieces have been marked with a permanent marker. This can be difficult to remove if it has been on the bricks for some time. Ben Tomlins from Brickoholics has recommended the use of hand sanitizer to remove permanent marker. He found it was removed without any damage to the print – something that is quite important to those wishing to use the parts for other creations. Magic Eraser (white sponges) – will remove the ink but may also remove the print and may dull the surface of the brick.